To see the cistern or not see the cistern, that is the question. 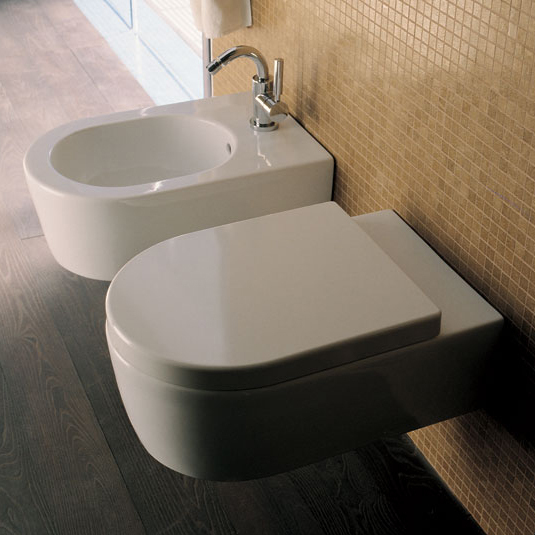 A WC with a hidden cistern can be ‘back to wall’ or wall hung. A back to wall WC has the pan sitting flush to the wall, while a wall hung WC is lifted off the ground, which makes it easy to clean around and gives a greater illusion of space. Freestanding, wall hung, back to wall? Wall hung WCs do not fall off the wall! You will be reassured to know that in Switzerland 83% of toilets installed are wall hung. A sturdy frame or brackets are used to support the toilet pan off the floor and a panel, sometimes called a duct, hides the cistern, also known as water tank. Loos where the cistern is visible can be close coupled, which means the cistern is directly connected to the WC pan with no visible pipe between them or, for a more traditional look, a visible flushpipe connects the cistern to the toilet bowl. The cistern is operated with a pull chain at high level or lever operated at low level. Many cisterns are dual flush which allows for a full flush, generally six litres, or half flush, generally three litres, as a water saving measure.